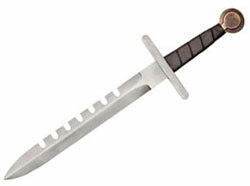 Assassin's Creed II Sword Breaker Dagger is 18 1/2" overall. Dagger has a 11 1/2" high carbon steel blade with a black leather wire-wrapped handle with brass pommel. This is an officially licensed product.